This manuscript consists of two parts: the first is a chronicle by William of Malmesbury (died 1143); and the second is a series of annals--with a particular emphasis on Bury St. Edmunds--as far as the year 1212, with subsequent additions. 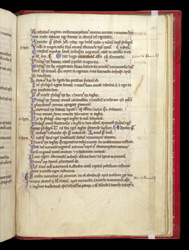 The manuscript was therefore almost certainly written at Bury in 1212. Two references to abbots of Bury St. Edmunds are signalled by a later reader by annotations in the margin. The first records the death of Abbot Hugh in 1180, and the second the appointment of his successor, Samson, in 1181. The last annal for 1180, in the middle of the page, is a reference to a new kind of coin being made in England: this was worthy of mention because there was a mint at Bury St. Edmunds.